In June 1994, a young waiter named Ronald Goldman left his restaurant job to drop off a pair of lost glasses at Nicole Brown Simpson's condo and the pair was brutally murdered. O.J. Simpson was found not guilty of their murders after a lengthy criminal trial in 1995 and though Simpson has maintained his innocence, the Goldman family was not pleased with this verdict. Thanks to YouTube, you can still see videos of Ron Goldman's father Fred talking about Johnnie Cochran, Simpson's lead defense attorney, in addition to what's covered in ESPN's documentary series O.J. : Made in America. "This man is the worst kind of human being imaginable," Fred Goldman remarked about Cochran in a September 1995 press conference, according to The Philadelphia Inquirer. "He compares racism of the worst kind in this world to what's going on in this case. ... This man is sick. He is absolutely sick." Goldman spoke about his frustration with the trial and the arguments of Simpson's defense team in multiple press conferences, but his closing argument remarks are the most passionate. Most of Goldman's frustration stemmed from Cochran shifting the focus of the case to accusations of Detective Mark Fuhrman being racist and planting evidence — accusations that Fuhrman has denied — which Goldman felt took away from the murders. You can watch these remarks in the video below. According to the Los Angeles Times, Cochran had compared Fuhrman to Adolf Hitler during the trial in September 1995, at which point Goldman "clenched his fists, twisted in his seat, and began to mutter angrily and audibly." Afterward, he raced out to air his grievances in a televised news conference, calling Cochran "a disgusting human being" who "ought to be put away." "He compares racism of the worst kind in this world to what's going on in this case. ... [He is] someone who shoves racism in front of everything, someone who compares a person who speaks racist comments to Hitler, a person who murdered millions of people," Goldman said, according to the Times. In another Times report, Goldman had stopped calling Cochran by name and would only refer to him as "Mr. the C-word." I have been to Israel on two occasions. I have been to Yad Vashem. That is why this is so painful to me. The Holocaust should never be repeated. ... I would never trivialize the tremendous loss of lives during the Holocaust. Simpson's sister Shirley Baker responded directly to Goldman's comments, according to the Philadelphia Inquirer. "You don't hear us talking about Marcia Clark," she said, reported the newspaper. "You don't hear us downing the Goldman family. You don't hear us downing the Brown family. ... It hurts us when we hear the prosecution say things about our loved one. ... But we do not come down here and attack them personally." 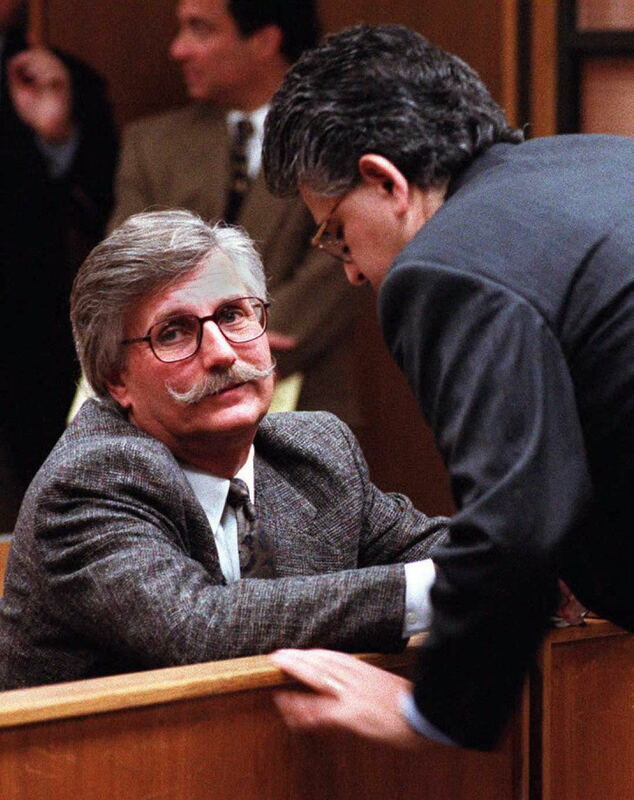 In August 1995, Fred Goldman held a press conference in which his disapproval for the trial's focus shifting to the accusations against Fuhrman, according to an Associated Press archive video. He doesn't name Cochran specifically in this video, but the frustration is apparent: "This is not now a Fuhrman trial. This is a trial about the man who murdered my son. How dare they take the position that all they want to do is prove perjury ... Do they all take us all for morons?" Watch those remarks in the video below. The Goldman and Brown families would go on to pursue a civil lawsuit against Simpson, in which a jury found Simpson liable for Brown Simpson and Goldman's deaths and he was ordered to $33.5 million in damages to their families.